Acetyl-L-carnitine acts on neurons (pictured here) that release the neurotransmitter glutamate. Researchers believe that, by altering glutamate levels, the molecule affects systems involved in depression. Depression is not a single disease. The term refers to a cluster of feelings and behaviors, brought on by a variety of underlying causes. And, unfortunately, it is often difficult to determine which type of depression a person has: a physician cannot take a mouth swab or a blood sample to diagnose the nature and severity of a patient’s psychiatric condition—at least not yet. According to a new multi-institutional study, published in Proceedings of the National Academy of Sciences, doctors may one day be able gain insight into an individual’s depression by analyzing his or her blood. 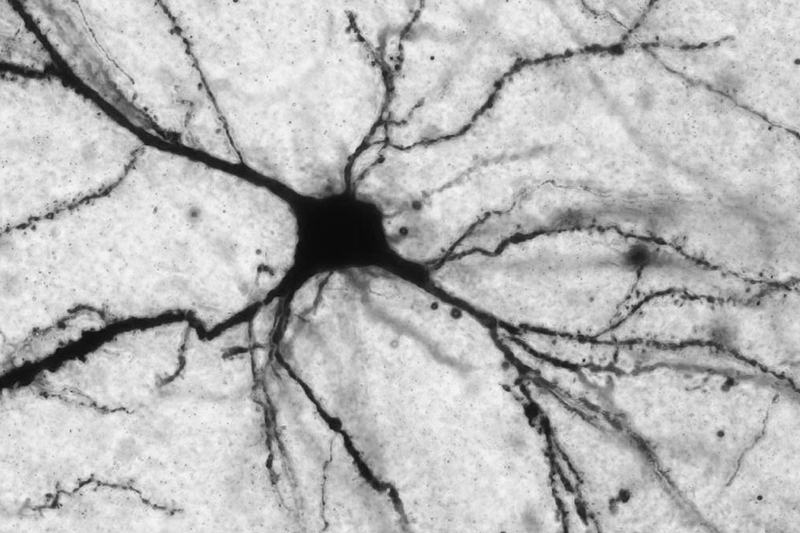 Rockefeller scientists Bruce McEwen and Carla Nasca, in collaboration with Natalie Rasgon, psychiatry professor at the Stanford University School of Medicine, show that patients with a particular type of depression have decreased blood levels of the molecule acetyl-L-carnitine (LAC)—a finding that may lead to improved diagnosis and treatment of major depressive disorder (MDD). Naturally produced by the body, LAC performs a number of crucial tasks in the brain. For example, the molecule regulates energy metabolism and interacts with DNA to promote the expression of important genes. Specifically, it acts on a gene that controls levels of the neurotransmitter glutamate—a chemical implicated in almost everything that the brain does. McEwen, the Alfred E. Mirsky Professor, and Nasca, a postdoctoral fellow of the American Foundation for Suicide Prevention, have studied the link between LAC and mood disorders using animal models. In one study, they showed that LAC supplements ameliorate depressive symptoms in mice by reversing brain-cell impairment caused by an excess of glutamate. In a separate rodent study, they observed that LAC treatment reduces depressive behavior and stress-associated neural dysfunction in the medial amygdala, a brain region involved in social interactions. These findings strongly suggest that LAC deficits contribute to a depression-like state in mice, leading the scientists to wonder whether the molecule plays a similar role in humans. These results suggest that LAC levels may be used as an effective biomarker—meaning, a measurable physiological trait that can indicate the presence of disease (sometimes in combination with other diagnostic techniques). In recent decades, physicians and researchers have been eager to identify biomarkers for psychiatric disorders, with limited success. This study represents unique progress, as it points to LAC screening as a potential tool for diagnosing a specific subtype of depression—a type that is highly severe, treatment-resistant, and that may stem, in part, from exposure to trauma early in life.